Roughting Linn Cup-Marked Rocks, Northumberland (photo credit: Ronald Sheridan). Os grid Reference TN 9839 3672. 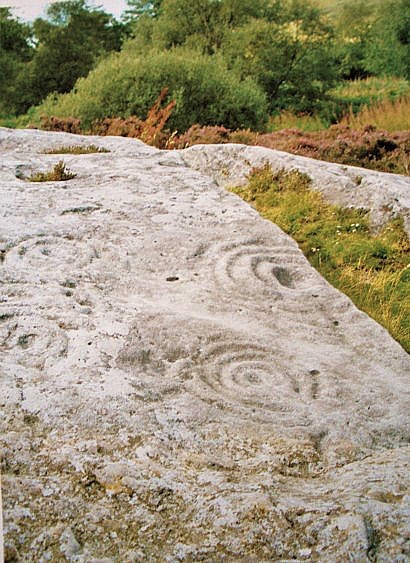 About 2 miles east of the village of Ford is the prehistoric, sacred site of Roughting Linn or Rowtin Linn, on Bar Moor, where there are many cup-and-ring markings or petroglyphs on a long, sloping slab of fell sandstone beside a quarry that was in use pre 1950. The site can reached to the north of the B6525, beside a lane between Milfield and Lowton near Roughting Linn farm. Walk a short distance into Linn woods where there is a waterfall on the Broomridgean Burn and also an Iron-Age hillfort (the rock carvings lay at the east-side of the hillfort). The coastal town of Berwick-on-Tweed lies 12 miles to the north-east and the town of Coldstream is 13 miles to the west. The long, domed-shaped slab of light grey sandstone forming the rocky outcrop with some very impressive rock-art is approx 20 metres in length and, thankfully the rock carvings have not been much disturbed by the adjacent quarrying. These prehistoric carvings are “thought” to date back over 4,000 years to the Neolithic to Early Bronze-Age periods. Luckily recent quarrywork activity has not caused too much damage to the cup-and-ring marked rock, apart from the western section, and the site remains the best known in the county of Northumberland and is the largest carved rock in northern England. There are “said” to be 160 or so rock carvings ranging from ordinary single cups, cups-and-rings with well-defined grooves, linked grooves, radiating lines, inverted arcs, maze-like carvings and keyhole-type motifs all spread out across this huge, long slab of fell sandstone that at first sight has the look of limestone – but it is not! Counting the carvings is difficult, but there are apparently 60 or more lesser-known ones (ordinary cup-marks) and 100 or so carvings that are much more interesting and more stunning to the eye. Many of the cup-and-rings are similar to rosette patterns with a small hollow in the middle and concentric rings running around that, and other carvings that are often seen on mazes. We don’t know what the radiating lines were for but maybe they were a way of connecting up each carving, or as a pointer system for directional usage, like the solar system with stars in alignment, which the ancient people would have known about at the time. The place was probably associated with spirituality, birth, death, magic and ritual. And there was undoubtedly a prehistoric community of beaker people living here that saw the rock and its growing number of carvings as very sacred. The site was first discovered back in 1852 by Canon William Greenwell who wrote about the carvings in two pamphlets for the Archaeological Institute at Newcastle, but unfortunately these were never published. Then later in 1865 Mr George Tate did the first drawings of the site. There are two more cup-and-ring marked rocks about 1 mile to the west just below Goatscrag Hill. Just beside the rock carvings stands an Iron-Age promontory fort with some very impressive ramparts at the south-eastern side, and there are the ditches of an ancient enclosure between the fort and the rock outcrop. But what connection this fort has to the rock-art we do not know. Maybe the Neolithic beaker community and, later Bronze-Age settlement were taken over by Iron-Age people who strengthened and built-up the place for their own security, but they too would have been well aware of the sacredness of the place, just as we are today! Bord, Janet & Colin., Ancient Mysteries of Britain, Diamond Books, 1991. Greenwell, William Revd., On the rock carvings at Roughtin Linn (un-published pamphlets 2 vols), The Archaeological Institute of Newcastle, 1852. Newbery, Elizabeth & Fecher, Sarah., Ford And Etal – A companion guide, Ford and Etal Estate, Ford, Berwick-on-Tweed, 1995. Categories: Rock Art, Roughting Linn Cup-and-Ring Marked Rocks In Northumbria | Tags: Roughting Linn on Bar Moor near Ford in Northumberland | Permalink. This is a comment to the webmaster. Your website is missing out on at least 300 visitors per day. I came to this page via Google but it was difficult to find as you were not on the front page of search results. I have found a website which offers to dramatically increase your traffic to your site: http://voxseo.com/traffic/. I managed to get over 10,000 visitors per month using their services, you could also get lot more targeted traffic than you have now. Hope this helps 🙂 Take care. Yes Bonny but what does it cost ?? Our pool could be fed having those photopages for you to consider price becoming portion of the “Best Remark Collection”. Think it such as a journal or even a magazine regarding general interest for anybody to study. Funny, witty, controversial, entertaining, useful, acerbic, thoughtful, serious, curious, unexpected comebacks are generally welcome. Thank you isabel you are very kind with these comments. I do try my very best as you have seen.